Real estate investment trusts (REITs) have many unique characteristics that make them a potentially great portfolio diversifier. The performance of REITs has been on par with US common stocks over the last few decades; however, the correlation of returns has varied from low to high over that same period of time. This non-linear return relationship of REITs to common stocks has provided a return benefit to investors over the past 20 years. REITs are divided into two basic categories: equity and mortgage. Equity REITs invest almost exclusively in real estate properties. Mortgage REITs do not own property directly – they finance properties through commercial loans. Mortgage REITs are basically a type of bond investment rather than a real estate investment. Our research focuses exclusively on equity REITs. Equity REIT index funds are a convenient way to own a broadly diversified portfolio of properties. There are approximately 157 different equity REITs that trade on the U.S. stock market according to FTSE NAREIT (Financial Times Stock Exchange - National Association of Real Estate Investment Trusts). Investors can gain exposure to a wide and varied plethora of real estate, including shopping malls, office complexes, long-term care facilities, apartment buildings, hotels, medical buildings, government buildings and even hospitals. US Equity REITs have a market capitalization of about $605 billion according to FTSE NAREIT. 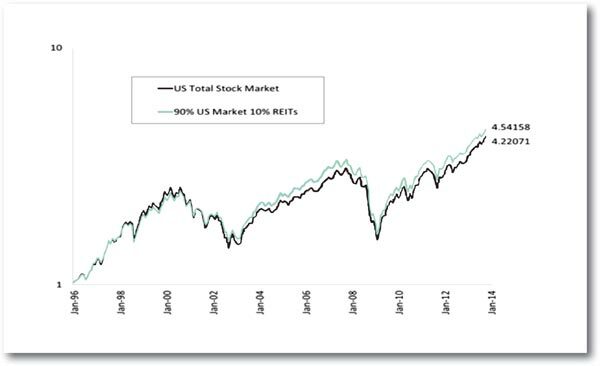 This is about 3% of the total US stock market of which the REIT market is a part of. Commercial real estate represents about 13% of the U.S. economy. Thus, if you desire a portfolio that represents the economy, the asset class is underrepresented by about 10% in the stock market. Fundamentally different than other asset classes. REITs have unique characteristics from common stocks. They’re the collateralization of several individual properties, have a unique tax structure where the trust pays no federal tax, and the correlation of REITs indices with common stocks varies – this confirms a unique risk. Provide a positive real return over time. REITs have a positive real expected return due to a combination of rental income and income growth. Landlords pass inflation increases to tenants based on a general level of price increases and this gives real estate owners a built-in inflation hedge. The value of real estate eventually reflects higher rents through higher prices. Available in a diversified, liquid and relatively low cost. An asset class must be investible and liquid. There are many REIT index funds and ETFs available to investors. These funds have daily liquidity and the cost to invest is reasonably low. A correlation analysis helps get past the first screen, fundamentally different than other asset classes. A rolling correlation analysis measures the dependency that one asset class has on the return of another over the long-term. Low correlation and varying correlation signals a low dependency, which implies the presence of unique risk in the asset class. 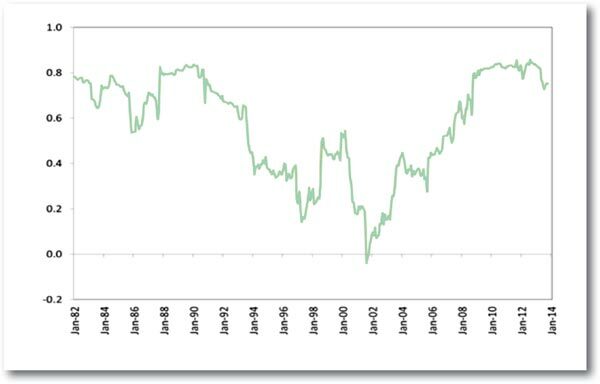 Figure 1 illustrates the 36-month rolling correlation between the CRSP Total Stock Market Index and the Dow Jones Select REIT Index, an all equity REIT index representing trusts with at least $200 million in market capitalization. The unique risk in REITs is evident in the figure in the form of high variability. Equity REITs are baskets of real estate properties that trade on a stock exchange. They offer investors an easy and liquid way to participate in the equity real estate market. Second-by-second public market pricing does have volatility due to varying supply and demand. This can be overcome by holding REITs for the long-term. A 10% allocation in a REIT index fund shifts a market weight holding of REITs closer to an economic allocation. In this simple example, a tilt toward REITs has added to portfolio return over time. At WT Wealth Management we believe each investor and portfolio is different. The proper REIT and proper REIT allocation will be different for each investor depending on their individual risk profile, time horizon and investment objectives. Figure 2 illustrates the return difference between one total US stock market index and a combination of 90% CRSP Total Stock Market Index and 10% in the Dow Jones Select Real Estate Index. The index includes all-equity REITs with at least $200 million in market capitalization. Adding a unique asset class to a portfolio that has positive real returns and low or varying correlation with common stocks may increase long-term returns. Every markets cycle is different and past results are no indication of future results. In this example all we are doing is looking at history, but in every research scenario that’s all we have to base future allocations decisions on. History has shown that a well-diversified portfolio that holds an economic allocation to REITs has shown to be a more efficient portfolio than one that includes a market-weight allocation. One disadvantage of REITs is the way they are taxed. Since federal taxes are not collected on the company level, the dividends from REITs are taxed as regular income on an individual tax return. This may make the investment less than optimal in a taxable account for investors in a high federal tax bracket. 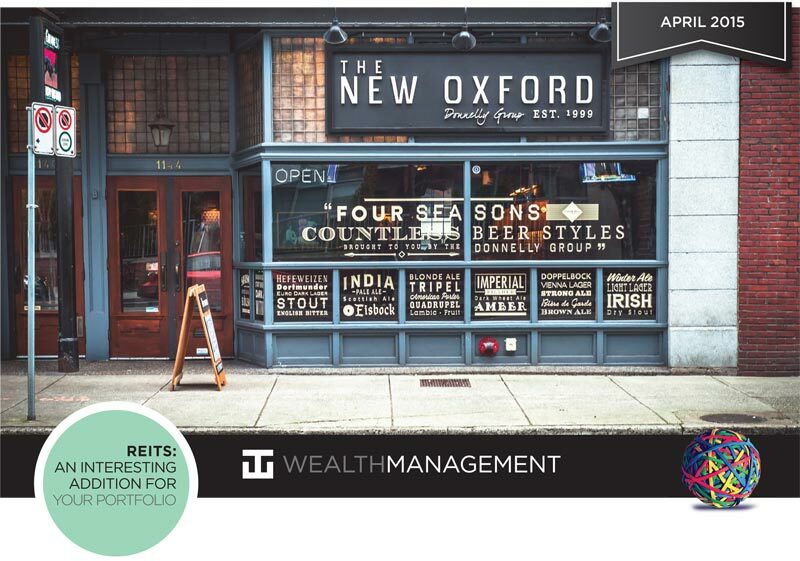 At WT Wealth Management we feel Equity REIT index funds are a liquid and convenient way to increase commercial real estate allocation that most investors and managers overlook because of common misconceptions about REITs. WT Wealth Management closely watches a universe of 25 REITs in a variety industries and sectors and prefers less economically sensitive REITs with exposure to hospitals, senior living centers, government buildings and medical buildings to name a few. What was once a portfolio add-on has become its own pillar of alternative investing. Real estate companies and REITs have gained respect and status in the last few years by performing along with or ahead of the broader market and providing some unique diversification traits. REITs are under-covered in our opinion and that makes them even more attractive as the lack of research presents an opportunity to add something to our clients’ portfolios they may not be getting elsewhere. In addition to the normal risks associated with investing, narrowly focused investments, investments in smaller companies, sector ETF’s and investments in single countries typically exhibit higher volatility. International, Emerging Market and Frontier Market ETFs investments may involve risk of capital loss from unfavorable fluctuations in currency values, from differences in generally accepted accounting principles or from economic or political instability that other nation’s experience. Emerging markets involve heightened risks related to the same factors as well as increased volatility and lower trading volume. Bonds, bond funds and bond ETFs will decrease in value as interest rates rise. A portion of a municipal bond fund's income may be subject to federal or state income taxes or the alternative minimum tax. Capital gains (short and long-term), if any, are subject to capital gains tax.